Well, not that one in particular. 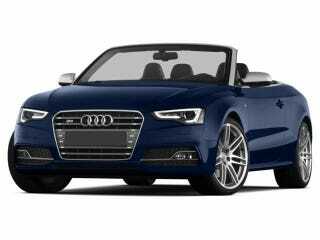 But I drive a 2013 Estoril Blue S5 Cabriolet. It currently is wearing 18" wheels with 245/40R18 Michelin Pilot Alpin PA4's as opposed to the 19" Pilot Sport 3 255/35ZR19's summer tires that came on it. This is my wife's car. Again, that's not her exact car, but you get the idea. Better ground clearance. Both 4WD. So here in suburban Chicago, we have had a lot of snow and cold. Even after our driveway was plowed, the snow blew back on top of it and there was 8 or 10" of cover. One of us has been going in and out daily, every day this week without all that much difficulty. One of us got stuck in the driveway yesterday the only time they decided to leave the house. So which one handled the snow better? The little SUV? Or the littler convertible that looks like it should be put on blocks for the winter? I love this car. It's like a cross between a cheetah and a mountain goat.